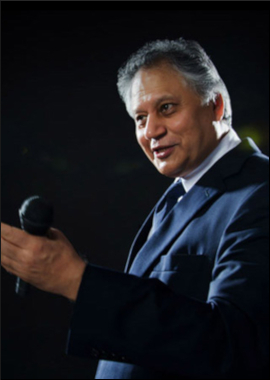 There are no business problems, only people problems -- and once these get resolved, so do the business problems, says motivational guru Shiv Khera, whose fifth book has just hit the stands while the first one has entered its 20th year and is set to be relaunched. "I am not an expert in any industry, but having lived in the US for over 40 years and worked in over 25 countries, I find that, all over the world, we don't have business problems, we have people problems and when we take care of our people's problems, most of our business problems are automatically resolved," Khera told IANS in an interview. Does this not sound like a one-size-fit-all sugestion? Khera disagreed. "People problems are not identical but they are very similar. Many times I am asked, 'Don't you find cultural differences in your audiences?' My answer is, 'I find more similarities than differences.' Emotional appeals are identical; integrity and cheating are given the same meaning in New York, New Delhi and New Zealand. There is no difference. The differences are many times cultural, which to me are very surface issues though they may not end up as surface issues," he explained. What then does his latest offering, "You Can Achieve More", have to offer? * To change reality, you must change mentality. * Achievers recognise that a big pay cheque and lack of accountability seldom go together." "It's all very well to say 'if you want to stand out, do something different' -- but how do you then deal with half-a-dozen people who want to pull you down? "Pulling people down is neither new nor is it confined to any country or society. It is universal. People who want to move up in life, constantly not only reinforce the positive but also insulate themselves from the negative. If we want to be in good health, exercising alone will not do the job, we also have to stay away from junk food. They go hand in hand," Khera explained. Noting that only internal strength of character can help a person overcome the external forces that pull him or her down, he said this strength can only be built by reinforcing the positive. "Just like an athlete builds physical strength with constant practice, similarly we build mental strength with constant practice." In terms of competitiveness, how has the world changed in the 20 years since "You Can Win" was published? "I have always felt that competition is good to have. Reason: It makes the good look better and the bad look worse; because people have something to compare you with. If the buyers do not have anything to compare you with, then how do they know you are good? "When buyers get value for money, they buy. My objective has always been that if I get one dollar, I must give them 10 dollars worth value. With this kind of mindset, you have no competition, you become the competition," said Khera, who has some of the top Fortune 100 companies as his clients. About his 20-year journey from the time his first book was published, Khera said he formally started penning down "You Can Win" in 1992, before which he had been capturing his thoughts on napkins, loose papers while sitting in restaurants or in transit during flights. He finished the manuscript somewhere in 1997; it was picked up by Prentice Hall in Singapore and published in the same year. It has since sold 3.7 million copies and will be relaunched this July. "Being an unknown author, getting your book to become an international bestseller was not easy. I travelled to different parts of the world, spoke at every conference that I could, whether paid or unpaid was immaterial. As people liked my message, they started buying my book." His roadmap for the future? "To institutionalise my messages by creating a programme online and also collaborating with some educational institutions helping them set up a Centre of Leadership Excellence to build good future leaders," Khera said. I have not yet read your new book, but I am sure it will answer some of my queries. One of the key issues in India and may be else where too is to have a healthy brainstorming at the top management level and arrive at concensus. It is good to have different view points to ensure to have all perspectives before concluding and framing action points. But is it often seen that owners or the man at the top wants like minded people which silently turns the group into some strong Yes men and thus favourites. All logics start working in their favour and soon the people dynamics starts and pulling down each other just to save ones job. Top management is scared to voice different opinion then the top man thinks and makes the working difficult for each other. So it starts reflecting down the line. So generally which is not a people problem, it appears to be at large. Accountability, metric system, comparisons at each stage is creating walls among relations and thus making people unsecured and thus the defence strategies in each mind, which is being often termed as professionalism. Hope you have covered this spect in your new book and provided some direction for solution. I may be reached at mghosh0510@gmail.com for clarifications and discussion if required. Looking forward to hear from you soon. All industry sectors are using new generation to kill their will and wish and businessman are killer to the educated and semi educated so bring the change employees are bankrupt we are suffering for our daily bread and butter.